IN SINGAPORE’S newspaper The Straits Times dated March 19, 1883, a short article was published entitled “The Muara Coal Mines (Brunei)” written by an unnamed correspondent who had visited the Muara Coal Mines in Brunei in the early 1880s. The correspondent noted that, “on the 13th March 1882, these mines were ceded to Mr C by the Sultan of Brunei for 20 years. They had been surveyed and partly worked by the first Labuan Coal Mining Company. They extend about 30 square miles. Mr C has full mining rights, no duties to pay, and the right to wood, &c. He is allowed to erect buildings, wharves, and piers, which he can remove at the expiry of the lease should it be desirable to do so”. The anonymous Mr C was actually Mr W C Cowie. In his notes, in the book “Report on Brunei in 1904 by MSH McArthur”, AVM Horton noted that it was in March 1882 that W C Cowie obtained a concession to work coal in Muara Damit. Mr Cowie obtained the concessions to the mine at a cost of $1,200 per year, quite a princely sum in those days. Before the 1900s, the hamlet of Muara was inhabited by a small group of Malay fishermen. However, it was the coal at Serai Pimping in Muara that attracted the Europeans to come here. The coals then were most likely to be exported to Labuan. The Royalist, a ship belonging to the Rajah of Sarawak or the Sarawak Government, must be at that point in time running a shipping line between Brunei, Labuan and Sarawak. The coal mine was located at Serai Pimping. Today that area is located where the big roundabout is at the end of the Muara-Tutong Highway. It is quite a fair distance from Serai Pimping to the Muara Port. The wooden pier referred to in The Straits Times’ article was left there, and modernised and then finally demolished when Muara Port was being built in the late 1960s. According to the people who lived in Muara in the late 1960s, there were still remnants of a railway line running from the coal mine all the way to the wharf at Muara Port. There was actually not much physical description in print about the coal mine at Muara, despite it being written about extensively. The Straits Times’ correspondent did us all a favour by describing the coalmine: “On arrival at the pit’s mouth we descended a short ladder and were at once amongst the coal, which is good even at this short distance from the surface. Being provided with candles we explored the seams. “Towards the hill was a fire which had been smouldering some months and the water from which, flowing towards us, was warm; we did not feel enough curiosity to penetrate far in that direction. On arriving at daylight we proceeded a little further and descended another and more worked mine, having coal seams branching in four directions. The article continued about the mine workers, who were a mix of Chinese and Malay, with some having the experience of having been working in the Labuan coal mines. The coal mine managers had been having difficulty in finding workers then due to an extensive wedding festival, and was prepared to pay so much per tonne to enable them to mine faster. 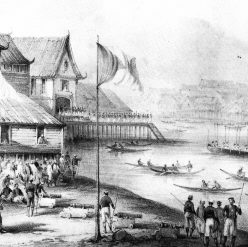 The Muara coal mine lease was eventually bought over by Rajah Brooke from Mr Cowie. Rajah Brooke renamed Muara Damit as Brooketon and continued to operate it until Muara Damit was redeemed by the Government in 1925.